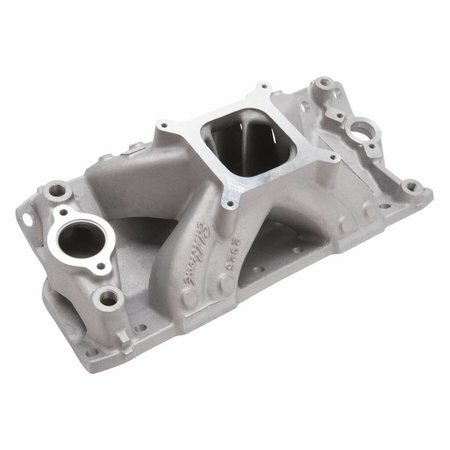 Edelbrock Super Victor intake manifolds are arguably the most popular and flexible manifolds in racing today. You'll find these single-plane manifolds on oval tracks, in drag racing, and on NASCAR engines--anywhere that maximum horsepower and torque are needed. The extended, constant cross-sectional area of the runners produces more torque across the midrange--from 3,500 up to 8,500 rpm in most instances. So, they deliver great throttle response off of the corners in oval track racing and improved 60 ft. times in drag racing. Their direct "line-of-sight" flow path provides maximum flow and there's plenty of material for port matching. They're also ideal for alcohol use.